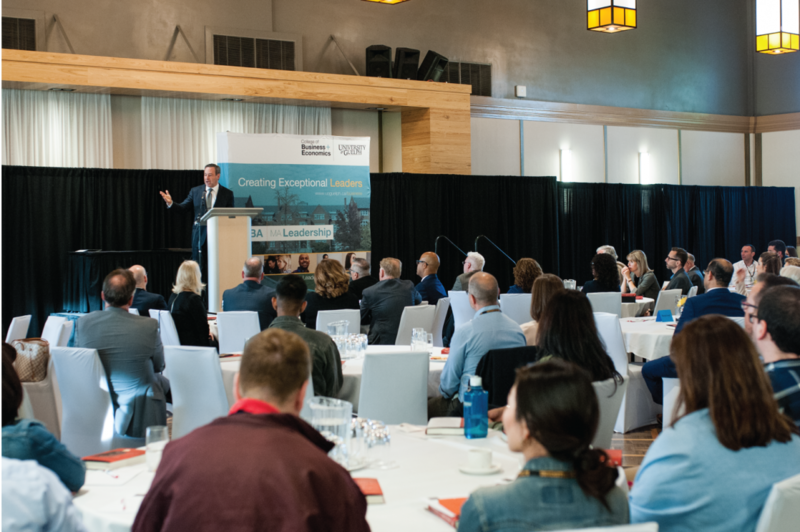 Noted political commentator, best selling author and senior editor of The Atlantic, David Frum spoke to University of Guelph MA Leadership students on Wednesday June 6th at Creelman Hall during the programs annual Luminary Leader Speakers Series, held during the each residential period. The audience consisted of approximately 200 students, faculty, staff, and members of the U of G community. A New York Times best selling author, Frum's latest book, Trumpocracy: The Corruption of the American Republic explores how U.S. President Donald Trump has undermined the most important political and democratic institutions in ways even the most critical media has missed. With over 650,000 followers on Twitter, Frum is a popular and outspoken critic of the U.S. president. From the latest foreign policy debate to the inner workings of the White House, Frum offered refreshing and clear insights into the complicated issues of Western politics today. In his quest for the truth, he advocated for shaking up the polarized U.S. political system and provided fascinating insights into what political outcomes mean for specific audiences around the world. Frum’s discussion of the political reality in the West included not only causes and observations, but also a number of interesting solutions, which are less often discussed. Prior to becoming a journalist and author, Frum worked as the head speechwriter for former U.S. President George W. Bush. Frum’s participation in the lecture series is a prime example of the value of intellectual debate within the academic community. The College of Business and Economics' Luminary Leader Speaker Series showcases exceptional leaders in a broad range of private business, non-profit and public sector fields. Distinguished authors, executives and entrepreneurs share their experiences and lessons learned regarding leadership within their respective industries. Jointly developed by Executive Programs and the College of Business and Economics at the University of Guelph, this annual event is part of the (MA) Leadership residential week and is designed to inspire, influence and ignite positive leadership development amongst our graduate students, alumni and faculty. Past speakers have included the Honorable Bob Rae and former politician, and diplomat Stephen Lewis. During the talk, organizational management prof. Sean Lyons was recognized for his contributions in teaching and research with the MA Leadership professorial award. Lyons' research explores inter-generational differences and dynamics in the workplace. Students and alumni also had the pleasure of hearing the 2016 valedictorian speech at the event. MA Leadership alumni Zahra Bhojani, Dan Gibson and Stephanie Deschenes were all nominated to serve at their cohort’s valedictorians.